Yesterday evening we had the great good fortune of attending the first of Simon and Garfunkel’s two sold-out concerts at St. Paul’s Xcel Center; the second is tonight. The heart of the show consisted of the duo’s renditions of the Simon and Garfunkel hits of the sixties that climaxed with “Bridge Over Troubled Water.” We thought it was one of the best shows we have ever attended. But the show also adds a duet version of one of Simon’s great solo songs, “American Tune,” and features the Everly Brothers in the middle of the set to perform “Wake Up Little Susie,” “All I Have To Do Is Dream,” and “Let It Be Me.” Simon and Garfunkel explicitly acknowledged the Everly Brothers as their heroes; they literally began singing together as teenagers trying to imitate the harmonies of the Everlys. All four of them then joined in the song that might be deemed the proximate cause of the festivities, “Bye Bye Love.” Who could ask for anything more? I saw Simon and Garfunkel perform twice in the sixties when Paul Simon’s guitar was the lone accompaniment. This time they were backed by a hot band including the venerable Warren Bernhardt on piano and Jim Keltner on drums. The arrangements updated hits that are now forty (in the case of Simon and Garfunkel) and fifty years old (in the case of the Everly Brothers). I was struck by how excited the audience was as it entered the arena before the show. During the show, the quality of the songs, the performances, the playing, the sound all added up to make it something of an emotional if not transcendent experience. The emotion triggered by the show can of course be written off to the self-indulgent nostalgia of the baby boomers like me who constituted virtually the entire audience for the show. But I wonder if it didn’t touch a deeper and more authentic feeling represented by the presence of Simon and Garfunkel’s original inspiration, the Everly Brothers (pictured below in their heyday). 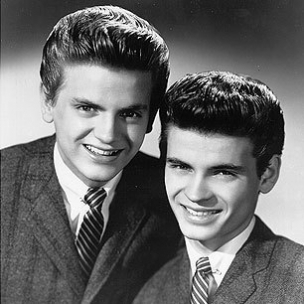 The Everly Brothers brought the close harmony singing of the recorded country tradition into popular music. That style of singing originates in the music of the Carter Family and runs preeminently from the Carter Family through the succeeding “Brothers” acts that deepened and perfected it — the Monroe Brothers, the Louvin Brothers, the Delmore Brothers, the Stanley Brothers. The demands of the form place a premium on conformity of timing, pronunciation, intonation and pitch that contribute to the difficulty of the style and the tradition of blood relationships among its practitioners. The inherent stress of show business combined with the addition of the family element to the equation must make the form extraordinarily intense. In 1973, for example, the Everly Brothers had a notorious on-stage breakup followed by a ten-year estrangement.